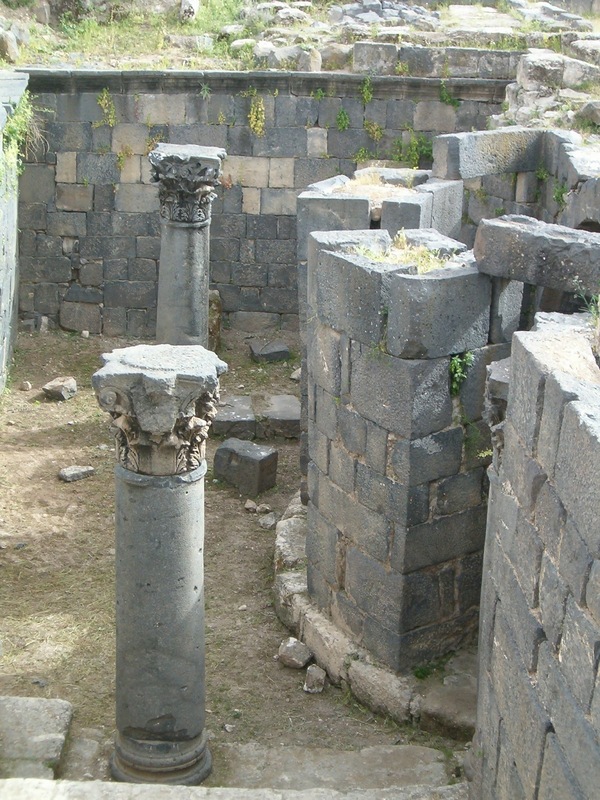 The Basilica at Umm Qais. The platform to view the Sea of Galilee. 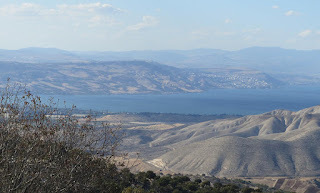 and looking over the mountains to the Sea of Galilee. I assumed he was Palestinian as they often come here to this place to see the land. For many Palestinians, it will be the only glimpse they ever get of their previous homeland or the home of their family. Muhammed our waiter brought us fresh green olives, grilled halloumi cheese, and lemonade with mint.....our favorite foods to enjoy after hours of exploring the ruins of Umm Qais. This is my favorite place in Jordan because of the unique black basalt and limestone ruins, but also because of the story. High atop the ancient ruins on the stone terrace, I envisioned Jesus and his disciples getting into a boat on the other side of Galilee. They made their way across the sea, heading toward Gadara which was many miles. Jesus was leaving his ministry in a Jewish region and heading to a known Gentile city, an unclean city, and one of the cities of the Decapolis. This was when according to Mark 4:35-41, a storm arose on the sea and Jesus commanded it to be still. The disciples marveled that even the "wind and sea obeyed him." View from the platform of the Sea of Galilee. The disciples still seemed confused about who Jesus really was. Immediately after this miracle, they arrived in the region of Gadara. When Jesus got out of the boat, a demon possessed man ran out of the tombs to meet him. Sitting there in the ancient city of Gadara, I could imagine this demon possessed man. The Holy Scriptures say he was naked, he had been cutting himself with stones, and was crying out from the tombs all day and night. He had been banished to these tombs. He had been chained by his hands and feet to the wall of the mausoleum, but he had torn them off, and broken the shackles (Mark 5:3-5). I imagined this madman running wild through the streets of Gadara in agony, an outcast, the lowest of low in this society. People were repulsed by him and would cross to the other side of the street to avoid him. 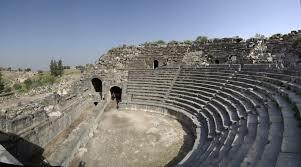 The Amphitheater in Umm Qais. ran and fell on his knees in front of Jesus. The demon inside of the man screamed, "What do you want with me, Jesus, Son of the Most High God? In God's name don't torture me!" (Mark 5:6-8) Because Jesus knew the man was possessed and had commanded the spirit out of him, the spirits immediately recognized who Jesus was. Jesus asked the spirit "What is your name?" and the spirit replied,"Legion, for we are many." The spirit begs Jesus not to send him out of the region of Gadara (Mark 5:9-10). A legion is a group of 6,000 and while it is impossible to know if that is how many spirits this man was possessed with, one can deduce it was likely thousands. The demons begged Jesus to send them into the herd of 2,000 pigs who were feeding on the hillside. One of the excavated tombs. Jesus gives the spirits permission and so they come out of the madman and go straight into the pigs, who then rush down the side of the mountain and drown in the Sea of Galilee. The men who were tending the pigs were astonished at what had taken place, and ran back to the city, shouting about all they had seen. Crowds from the city, perhaps in an uproar, came out to see who this Jesus was. The townspeople were absolutely terrified because they saw the former crazy man, wearing clothes, and sitting "in his right mind" at the feet of Jesus. The madman had been vindicated and restored. Out of deep fear, the people of Gadara then BEG Jesus to leave their region. And so He prepares to leave, but not without the former madman begging to go with him. Jesus refuses and tells the man to go back home, to his own people and tell them "all the Lord has done for you." And so, the man went and began to tell everyone all that Jesus had done and the scriptures say, "All the people were amazed." (Mark 5:20). Jesus gets into the boat and goes back to the other side of the Sea of Galilee. He had come all this way for just one madman. A main street near the Amphitheater. Today in the north of Jordan near the border of Syria, you can walk the ancient black basalt streets of Gadara, unique and unlike other ancient ruins in this land which are largely made from limestone. 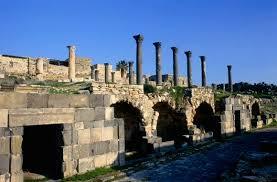 Umm Qais is made of both black basalt and limestone, a beautiful contrast. You can walk past where merchants likely sold goods, and visit the well preserved amphitheatre that has managed to remain in tack through the years of earthquakes and other upheavals in the area. In the amphitheater you can see where the orchestra would sit and the ornate seats reserved for dignitaries. One can even imagine the performances that once took place on this stage. As you wander around the city, you can visit the church with a mosaic on the floor and view where the hippodrome once stood. There are even still remains of the Basilica and former public bathhouse. You can also visit an area of tombs and walk down to a gated area. There you can peer inside to see what remains, mainly cold slabs of stone and rocks. Perhaps you can also imagine the possessed man who was once chained to a cold stone wall, writhing in anguish until Jesus showed up to save him. 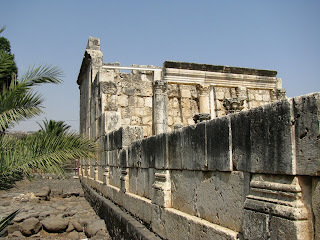 The terrace at the Umm Qais Rest House. Gadara was occupied with inhabitants as early as the 7th century BC. It was in 63 BC that Pompey liberated Gadara and joined it to the other Roman cities of the Decapolis. The city reached its peak in 200 AD and was compared at the time to the greatness of Athens. Not surprising, Christianity spread very slowly here and was eventually taken over by the Arab Muslims in 636 AD. The city fell to an earthquake in 737 BC and was largely abandoned. 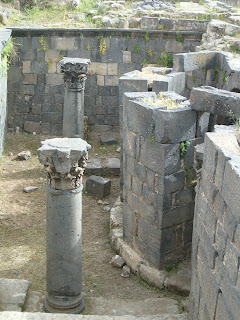 Umm Qais is still an active archaeological site; they are still uncovering and discovering new parts of this city. You can wander through this hillside 1,240 ft above sea level and see misplaced rocks and pieces of the ancient world, leaving us small clues as to how the Gadarenes once lived. There is also a quaint museum to visit housing many artifacts uncovered here in Umm Qais. The entire archaeological site is quiet and peaceful, and you will often see shepherds herding their sheep along the way. This is my favorite place in Jordan. I will always go back to walk the basalt streets and marvel at the basalt columns intermixed with limestone. 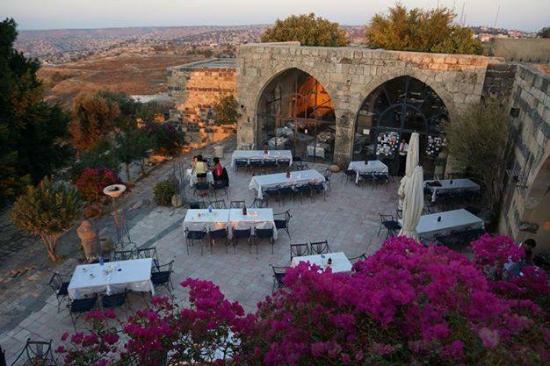 I will go back for the fresh olives and Arabic mint tea, to sit in the breeze on the terrace and look over the Holy Land. And I will always go back to reflect on this story of the day when Jesus crossed an entire lake to save one man. 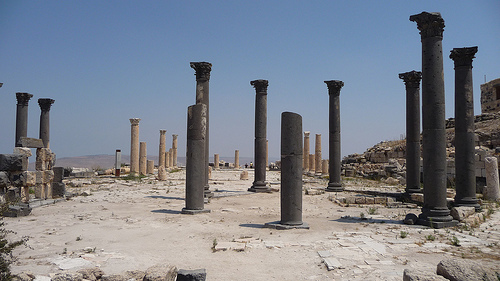 Experience all Umm Qais has to offer with a trip to Jordan through Beyond Bethany Tours.